Compared to the existing single-layer monochrome Song Dynasty’s “carved glaze” and “scratch carving” ceramics techniques, the polychromatic-layer “sgraffito” was Su Shi-Hsiung’s ingenious technique. Commencing the experiments of multi-layer carved glaze in the 1980s, due to considering the design of the composition before coloring, 6-8 layers of glaze carving prior to kilning plus the control of multi-layer glaze flow and integration, it is 20 hours of firing temperature, insulation and cooling needing to be tightly controlled, under a number of difficult challenges, the successful finished meeting the creator’s standard often remains only half. 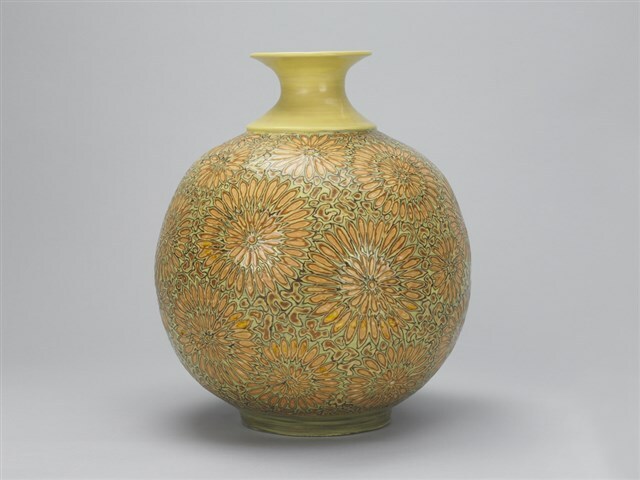 This piece, on a small-mouth rounded shape, is carved daisy patterns composed by six layers of glaze outward from inside which are titan yellow, red brown, yellow, brown, orange, yellow. The gap is a solid infill of porphyritic base vein, showing yellow system’s magnificent color change; compared to the traditional lacquer “carved color” brilliant colored beauty, this can be described as different approaches but equally satisfactory results.